Fitting sessions will all take place at the Northford Ice Pavilion. The fittings will be done by Hamden Sports in the Yale room, located in the back of the Blue Rink. These session are the only opportunities you will have to order your uniforms for the upcoming season. You should not go to Hamden Sports directly. Skaters should bring shoulder pads, and goalies should bring chest protectors to ensure proper fit of jerseys. 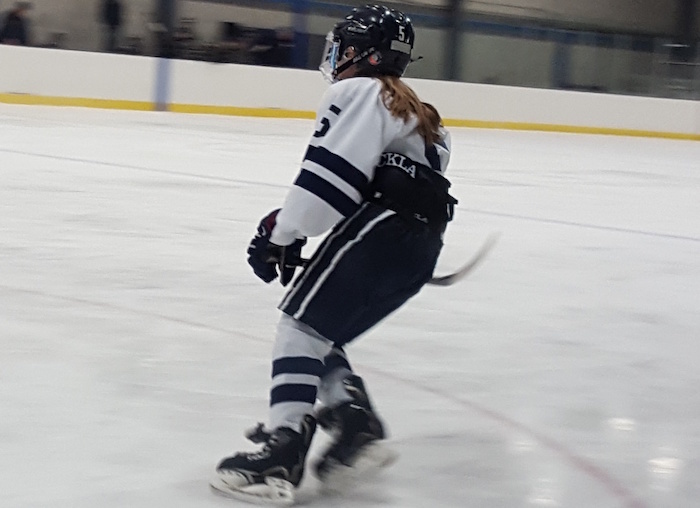 The Yale Youth Hockey Association uniform policy is as follows; All players must purchase and wear the approved Home (white) and Away (navy) jerseys, along with matching socks and shell. Players must be equipped with a navy blue helmet which shall feature the Yale 'Y', and also navy blue gloves. Members are also encouraged to purchase warm-up suits. Jersey numbers for players new to Yale Youth Hockey Assocation are being finalized and you do not need your player's jersey # in order to place your uniform order with Hamden Sports. Please note for existing players, all jersey numbers will remain the same for the 2019-20 season. Players in our House, Learn to Skate, or Midget programs do not need to attend any uniform fittings. If you have any questions regarding uniforms or uniform orders, contact Dan Tinson at . Do not contact Hamden Sports directly. Below are the tryout results for 14U (2005 & 2006 birth years). Players are listed under their assigned team by their jersey number and color. If your players jersey number/color was changed during callbacks, the new number/color is reflected in the results. Head Coaches for each team will contact each player’s family within the next day. If your player’s number was inadvertently left off the results, please contact me. For any questions directly related to the tryout results, please wait 24 hours before reaching out. All season commitments are done online, and must be completed by Monday, April 15th. Please log into your Yale Youth Hockey account, go to the registration tab on the left, and select the proper team for your player. Online commitment for all 14U teams will be available shortly. Below are the callback groups for 14U (2005 & 2006 birth years). Players are listed by their jersey number and color. Please note, there are a few players that have their birth year listed after their jersey number due to duplicates. In addition, each goalie is assigned to 2 callback groups as noted below. Please attend the callback sessions that you are assigned to. 14U Group 1 - Callback sessions are Friday April 12th at 5:40 and Saturday April 13th at 1:30. 14U Group 2- Callback sessions are Friday April 12th at 6:50 and Saturday April 13th at 2:40. 14U Group 3- Callback sessions are Friday April 12th at 8:00 and Saturday April 13th at 3:50. If your player's number was inadvertently not listed, please contact dtnyyanks@att.net for your callback group. 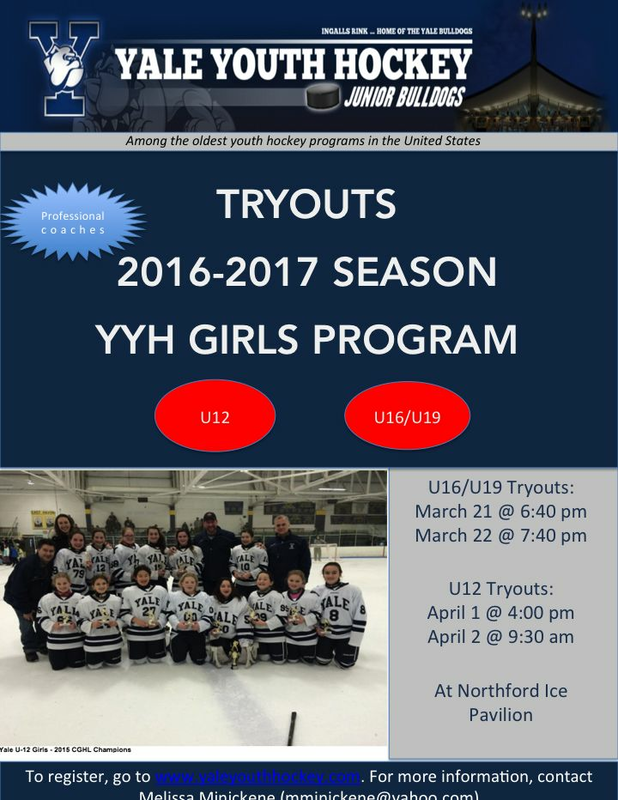 Call Back Groups for 14-U will be posted on www.yaleyouthhockey.com – Friday Morning, April 12. Join Steve Novodor and Jon Belonio and one of New England's finest coaching staffs as they take you through workouts designed to keep you ready for tryouts. The entire Yale Youth Hockey Community extends our deepest condolences to the Steven's Family. Steve Stevens passed away suddenly early Sunday morning. A dedicated father to Matthew and Nicky, he loved watching his boys play hockey. A Moment of Silence was observed in his honor Sunday morning before the start of Nicky's Yale 2007 AA team's Semi-Final CHC Tournament game. Please keep them in your thoughts and prayers during this very difficult time. Shaun Hannah Named CT Hockey Impact Coach of the Year. The video is fantastic. Watch it! 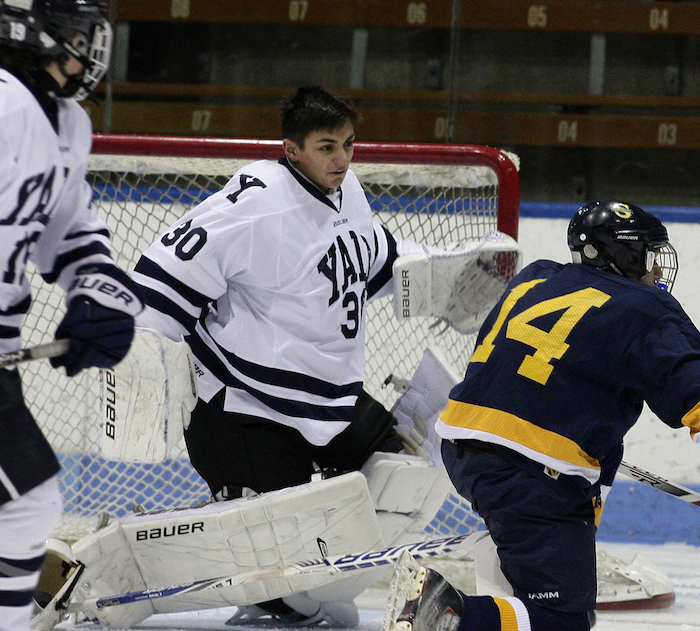 Yale Youth Hockey Association will present the prestigious Carl Marottolo Award and Jeff Beecher Award on Friday, February 15 at the Yale Men's Hockey game Vs Colgate. The Award will be presented on the ice between the first and second period. All Award Recipients with 10 Minutes Remaining in the First Period should proceed to the Vending Machine area near our locker rooms on the Yale side of Ingalls Rink. Please make sure not to be late. Coach Brian Moriarty's and his Staff's 12-U 2006 AA Finish 2018-2019 CHC Season Undefeated. Shaun Hannah is one of two Finalists for CT Hockey Impact Coach of the Year. The video is fantastic. Watch it! Then be sure to Vote for Shaun. Yale Youth Hockey Association will present the prestigious Carl Marottolo Award and Jeff Beecher Award on Friday, February 15 at the Yale Men's Hockey game Vs Colgate. The Award will be presented on the ice between the first and second period. Please save the date. Come and support our Award Recipients. 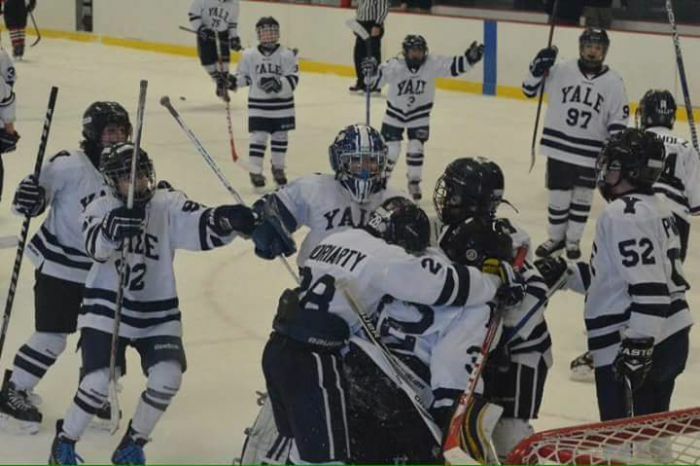 Coaching Pool – Our Coaching Pool includes current Yale Youth Hockey Coaches including Non Parent Coaches Edward (Eddie) Johnston, Alex Hoslet and Others. 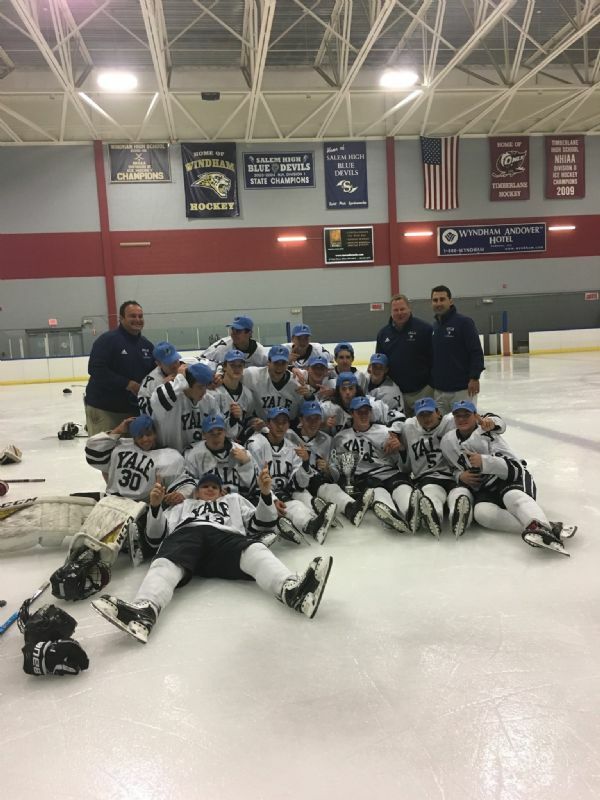 Congratulations Yale 2003 AAA beating the Sprinfield Rifles 5-0 in the Championship Game. 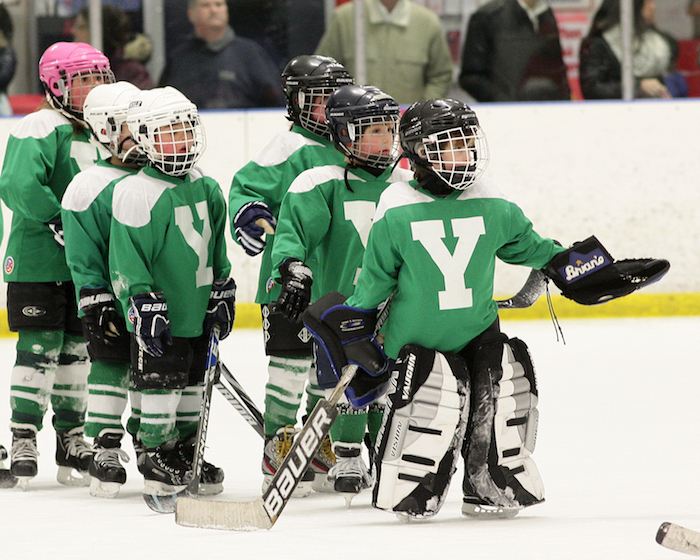 Please review the Yale Youth Hockey Policies and Procedures located on the left side of the Yale Youth Hockey Website. Additionally, all suggestions, issues, concerns, etc. should be directed to President - Charles Andriole and/or Vice President - Robert Zyskowski. Please do not contact Director - Hockey Ryan Hardy. Ryan Hardy and Friends Hockey Camp begins tomorrow. We want all Yale Youth Hockey Players to have the opportunity to attend. Register Now! We are receiving significan interest from Non Yale Youth Hockey Players since Ryan announced the Coaching Staff on Saturday. I have not ever seen at any camp anywhere the quality of the Coaching Staff that Ryan has assembled for our camp this week. We are very excited to announce the Inaugural Yale Youth Hockey Golf Tournament to be held on Tuesday, September 5th at beautiful New Haven Country Club. Please see the attached flyer for additional details. 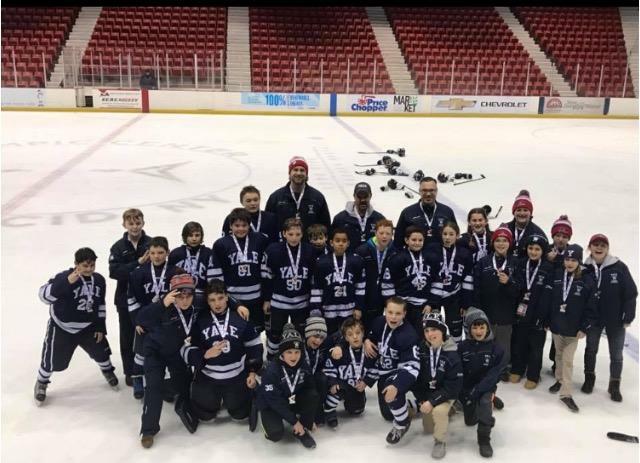 Over the past several years, we have seen Yale Youth Hockey grow and the vision of this tournament is celebrate these successes while also serving as a general fundraiser for the Association. 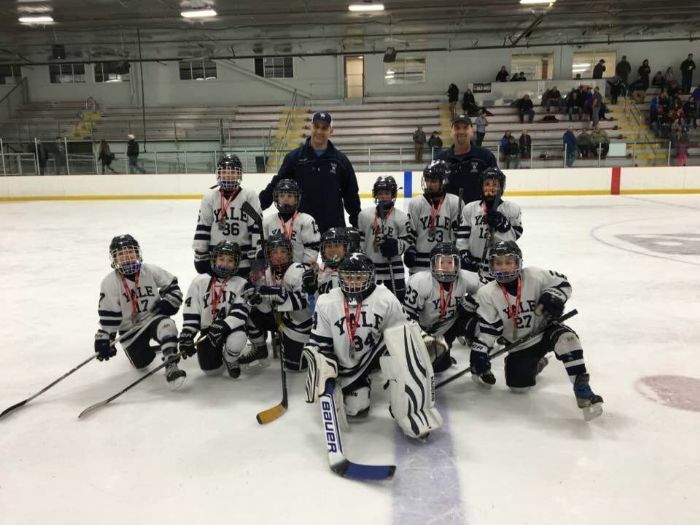 The fundraising dollars will directly contribute to the development of our players and support Yale Youth Hockey as one of Connecticut's premier youth hockey organizations. Our objective is to make the Yale Youth Hockey Golf Tournament an annual event. We are hoping our current membership, as well as those outside the Association will support this Tournament in one of many ways. For those golf enthusiasts (or those of us who get out only a few times a year), come play 18 holes at one of Connecticut’s oldest and most prestigious private country clubs. This beautiful two-tiered course offers a great day for golfers of all kinds. Are you interested in being a sponsor? There are many different sponsorship levels to choose from. Would you like to volunteer the day of the event? Whatever your interest, there is an opportunity. 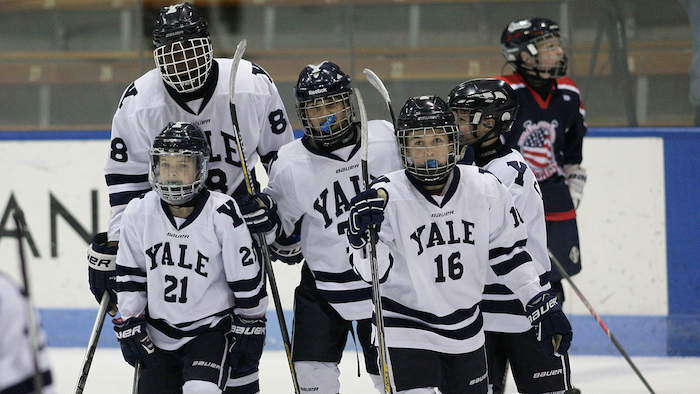 We are thrilled to establish a new tradition for Yale Youth Hockey and share it with our dedicated hockey community. The time of year coincides with the kick-off of the new hockey season. What better way to do so! We are looking forward to a great day of golf and on and off course specials to make the day even more memorable. We look forward to this date and to see you at the event. Congratulations to the following Yale Youth Hockey Players Selected to Team Connecticut. Good luck to all as they represent Yale Youth Hockey at the USA Hockey New England District Camp in ealry July in Keene, New Hampshire. Congratulations to our Yale Midget 15 Team - 2017 Tier 1 National Champions. 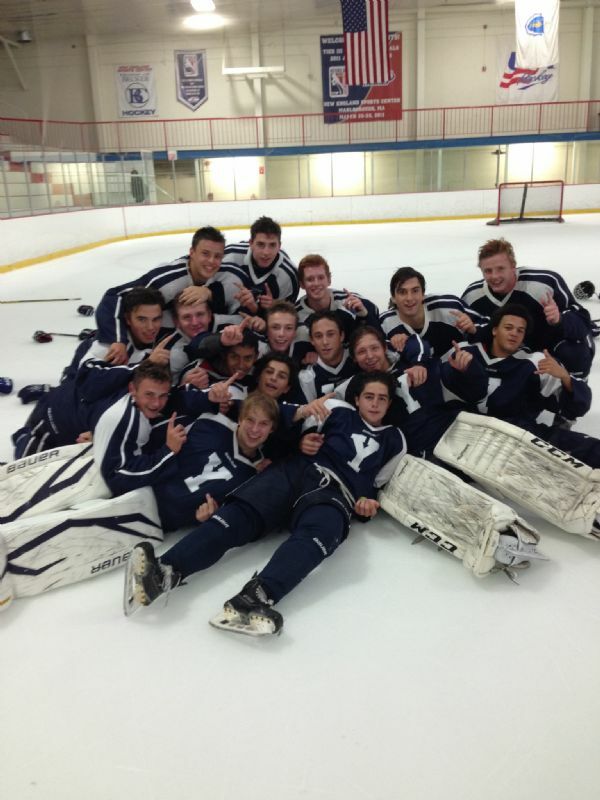 Our Yale Midget 15 beat the Colorado Evolution 7-2 in the National Championship game. Great work boys and Coach Novodor, Coach Bellonio and Coach Dickinson! 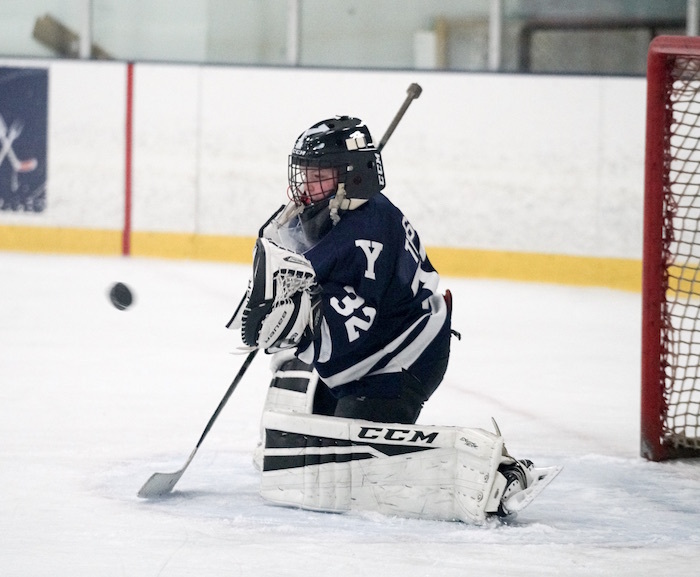 Congratulations to 14U 2002 AAA Yale Jr. Bulldogs forward, Aden Hotchkiss, who was named @CTHShockey's CIAC Division I Rookie of the Year. Aden was a star player for Xavier after playing two seasons with Coach Novodor on the Yale Jr. Bulldogs 2002 AA/AAA team. Prior to coming to over to Yale, Aden was a long-time standout in the West Haven Youth Hockey Association. 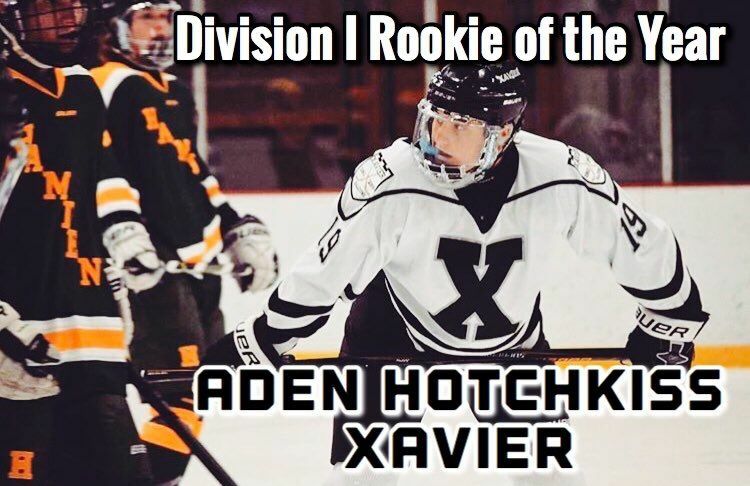 We are extremely proud of the progress that Aden made in his two years here at Yale and are happy to see him getting some recognition for a great freshman year at Xavier. 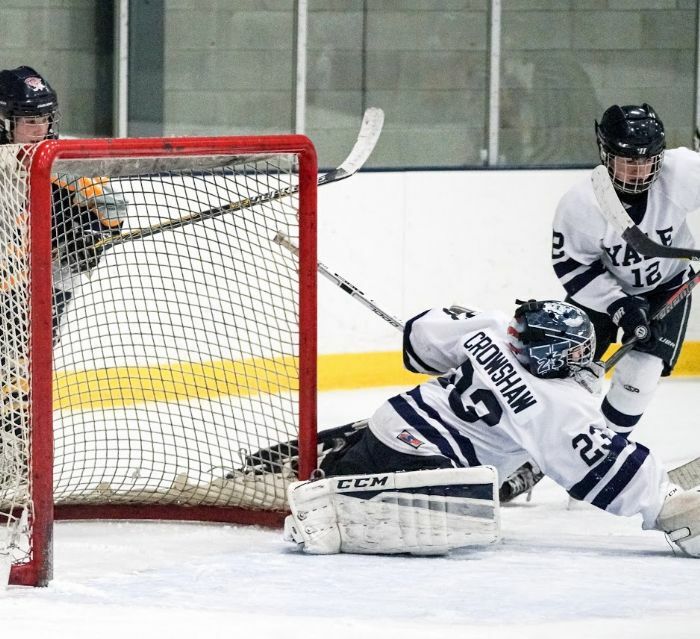 NOTE: @CTHShockey is a twitter handle/blog run by Luke Devoe which is the premier and most accurate resource for all things in Connecticut High School Hockey. Michael Linder "The Heart of a Lion"
Yale Youth Hockey Player Michael Linder is featured in the current edition of USA Hockey Magazine. This is a wonderful article about a courageous boy and a wonderful family, Michael and his twin brother Jack both play Pee Wee hockey with Yale and big brother Billy is a Yale Bantam. Michael's mother Megan and father Dennis make it all happen for all of their children and we are grateful they are part of our Yale Youth Hockey Family. 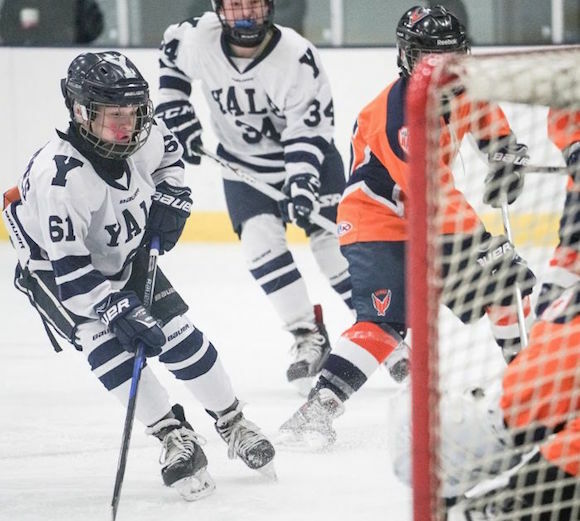 Over the past five years, Yale Youth Hockey Association has striven to become the premier youth hockey program in Connecticut. In that time, we have accomplished many wonderful things on and off the ice, highlighted perhaps by our selection as a USA Hockey Model Association. This is a distinction that we are very proud of and one we look to honor with continued progressive thinking and innovation in player development. We are proud of what we have accomplished thus far, but also feel that we have not even scratched the surface of our potential. Five years ago, our mission was simple. We were looking to provide our players and families with a strong, community-focused culture while catering to three types of players: the recreational player, the intermediate player, and the advanced player. While we feel that we have grown significantly in all three of these phases, we are most excited for what’s to come in 2017-2018. While this is not a complete list, we want to introduce you to some of our most exciting initiatives. We are very pleased with the development of our players and coaches over the past five years. That said, we are always looking to improve. In 2017-2018, we will shift to an even more individual-focused player development structure, where each player will be consistently evaluated and given performance-based, tangible goals throughout the season. We want every player to continue to polish their strengths, and more importantly, understand and correct their deficiencies. 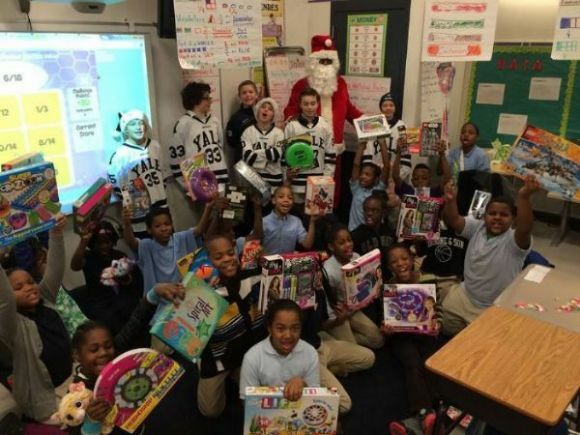 We want every player to become best hockey player and person they can be. We feel that if we highlight a player’s strengths and deficiencies (on and off the ice) several times throughout each season during the six-year window from 10-U (Squirt) through 14-U (Bantam), we can make far more significant progress in each player’s development than in the traditional coaching structure. This will be implemented for every team throughout the program regardless of whether a player is on the advanced track, the intermediate track, or the recreational track. While we will continue our focus on skill development, we will also place significant emphasis and detail on cultivating “Hockey Sense” and “Competitiveness/Mental Toughness” in every player. These two attributes are the most important areas of focus in developing Elite Hockey Players. There is a misnomer in our hockey culture, that competition drives development at the younger levels. Many “hockey salesmen” will lead you to believe that you are holding your child back if they do not play on the highest level team at the earliest possible age. We believe for most youth players, excessively challenging competition at the younger levels is detrimental to a player’s long-term development. Our objective is to provide an appropriate competitive environment for all players. We will continue to create and provide a competitive and challenging environment while limiting unnecessary travel time, costs and stress on our families. We feel that our AA/AAA Major/Minor structure will allow us to accomplish our goals, while containing the travel and costs associated with many of the self-proclaimed Tier 1 programs. While we will continue to offer teams in the traditional structure (A, A1, B, etc.,), we will also offer AA/AA Major/Minor teams 10-U (Squirt) through 14-U (Bantam): 9-U Minor 2008 (Squirt), 10-U Major 2007 (Squirt), 11-U Minor 2006 (Pee Wee), 12-U Major 2005 (Pee Wee), 13-U Minor 2004 (Bantam) and 14-U Major 2003 (Bantam). To establish a more refined age-specific training/development structure for our players from 9 years old through 14 years old. To create an environment which allows more players to participate on the “advanced player” track within Yale Youth Hockey Association. To provide our players with the highest level of training and competition while continuing our mission to reduce unnecessary travel, travel expenses and costs associated with the Tier 1 programs prevalent in the Northeast. While Yale Youth Hockey Association will continue to offer Skating/Skills and Drills with Shaun Hannah exclusively for players in the traditional A, A1, B structure, we will also introduce the Yale Youth Hockey Player Development team to players in our 9-U – 14-U AA/AAA Major/Minor structure. The Player Development team will be Directed and Instructed weekly by Steve Novodor and Jon Bellonio, with assistance from the Head and Assistant coaches of all 3 AA/AAA levels. The Player Development team will develop a 3-Phase Progression Model which will provide appropriate enhanced and specialized skill development for our AA/AAA players. This will allow us to provide individual player specific development. Every Yale Youth Hockey player will have the opportunity to work with either Shaun Hannah, Steve Novodor, or Jon Bellonio (NCAA Division I, NCAA Division III, Junior Hockey and/or Prep School Coaches) on a weekly basis. 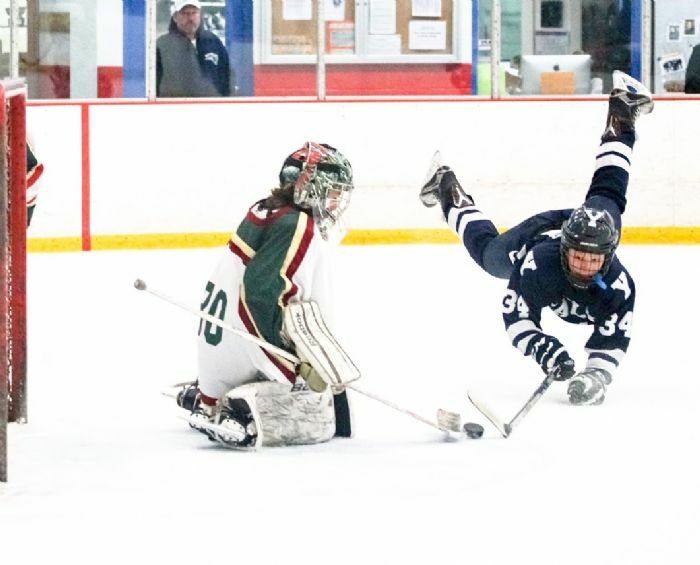 Yale Youth Hockey Association also hopes to create (Pending Number of Participants) a Non-Checking league where intermediate and recreational players can continue their love of the game of hockey. Try-Out is not required, however players who do Try-Out for Pee Wee and Bantam who are best served in this league will be directed to it by evaluators. Players who are interested should Register when Try-Out Registration opens. Thank you for your continued support of Yale Youth Hockey Association. We look forward to a successful conclusion to the 2016-2017 Season and the exciting times ahead in 2017-2018 and beyond. Congratulations to our Yale Bantam 2003 team - Kennedy Memorial Tournament "JWK" 2017 2003 Elite Division Champions. 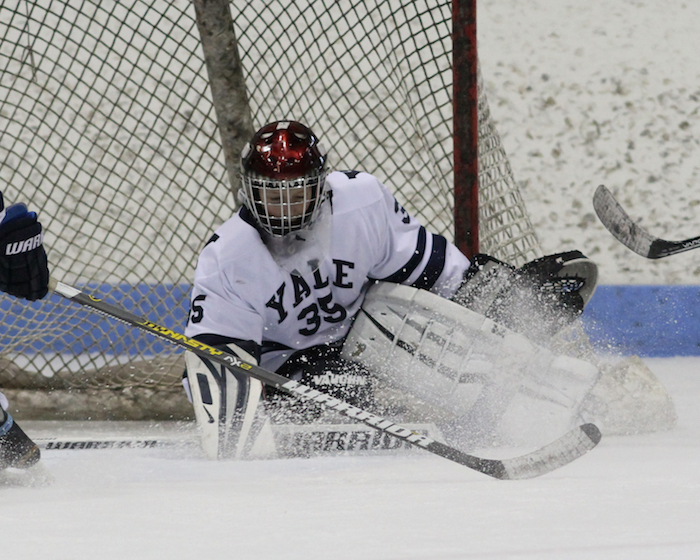 Yale played this weekend in the Greater Providence area. 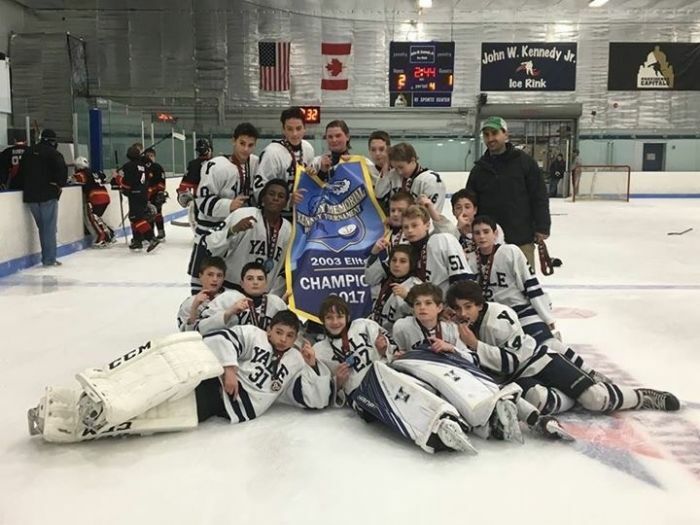 Our Yale Bantam 2003s defeated the Connecticut Junior Rangers 2003 in the Quarter-Finals, the New Jersey Devils 2003 Futures in the Semi-Finals in the 3rd OT. We won the Championship Vs the Minuteman Flames 3-2 in OT. LiveBarn: www.livebarn.com is great service which provides Live Game Video of Games and Practices on a specific rink basis and OnDemand basis for Games. 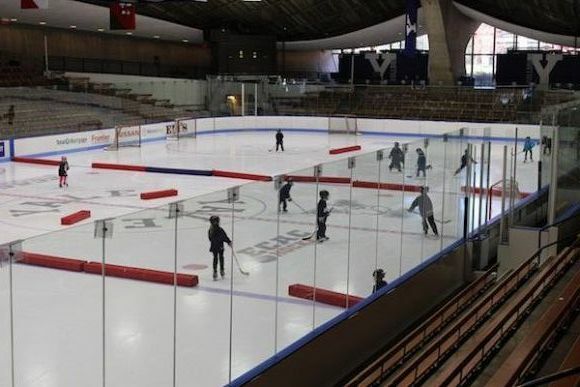 LiveBarn has been installed in many rinks in Connecticut and Massachussetts and Rhode Island. I have attached a link to a YouTube Video for your review. Sign up using Promo Code 39e4-d78f to watch games and practices Live & On Demand, share clips on social media/email and submit highlights to be considered for Plays of the Week. LiveBarn offers a free trial, and you can cancel at any time. Congratulations to our Yale Squirt A - Wallingford Columbus Fall Classic 2016 Champions. Our Squirt A team won all 5 games including a 5-4 double overtime over the host team, Wallingford Hawks. 1. The Yale Press Boxes are Off-Limits to ALL. 2. Please keep the rink clean -- pick up your trash. 3. Absolutely no stick play with balls or pucks in the hallways, stands or in the hallways leading to the locker rooms. 4. Children must be supervised at all times by parents or guardians. 5. All teams and coaches must dress in the locker rooms. Dressing in the hallways and common areas under the rink is prohibited. This season we have scheduled Skaters and Goalies on the same night so both Skaters and Goalies can more easily dedicate one night per week to their own their individual skills. Attendance at these sessions is highly encouraged. This is where the difference in skill development progression will be fostered. Skills Sessions "Power Skating" for Skaters, under the direction of Shaun Hanna are an important component of the Yale Youth Hockey culture and program, therefore there is no additional cost. Skills Sessions "Skills and Drills" for Goalies, under the direction of Jared Waimon-Pro Crease are an important component of the Yale Youth Hockey culture and program, therefore there is no additional cost. Jared will be assisted by various other goalie coaches and current college goalies. These sessions are about building habits, learning how to analyze a play and finally technique. This last component is where these coaches can drive the optimal process, the skills that really matter, tracking, depth, skating, competing. Congratulations to our Yale U-16 Midget team which advanced to the National Tier 1 Quarter Finals in San Jose, CA today. Our U-16 finished first in their Group and play Little Ceasar's tomorrow at 1:00PM EST. Our Yale Mite A won 2016 CHC Patrick Division Championship with a 6-2 win over West Hartford in the Championship game today. Our Mites completed the tournament with 3 wins and 1 tie. Congratulations to our Yale Mite A players and coaches. Yale Youth Hockey Association is pleased to announce that Coach Brian Lugo will join Yale Youth Hockey as a Coach of our 2016-2017 Pee Wee AA. Brian fits uniquely into our future youth hockey development and coaching development model. He will begin immediately following the current 2015-2016 season in April. This is a great opportunity for Coach Lugo to integrate, contribute and flourish in our collaborative coaching environment. Brian will be strategically and actively involved in our Squirt, Pee Wee, Bantam and Midget levels. Yale Youth Hockey Association welcomes Coach Lugo. Coach Brian Lugo has been coaching ice hockey at the Tier 1 and Tier 2 level for over 15 years. He has coached from the Mikes through Juniors. He is USA Hockey Certified at every age level. Coach Lugo specializes in creating great skill, systems, and the mental toughness to compete at high levels. With great work ethic has come great success. This culminated with a national championship at the Midget level in 2013. Coach Brian also coached high school hockey for three years before moving to Connecticut. Winning state championships two out of the three years. He has also worked with many players that have gone on to play at higher levels including USHL, BCHL and Division 1 and Division 3 College. Coach Brian enjoys watching players develop to their fullest potential. Players will be challenged to reach their full potential. Andriole forces a weak shot leading to a breakout. Charle and Rory Andriole and Connor Smith are in Quebec City playing for Team Doritos Tournoi International de Hockey Pee-Wee de Quebec / Quebec International Pee-Wee Hockey Tournament. Last night we played an exhibition game vs the number 1 Girls Pee Wee team in Quebec, coached by several three time Canadian Women's Olympic players. The game was all over the Quebec Province TV and Print News. This is a great picture in the local press. 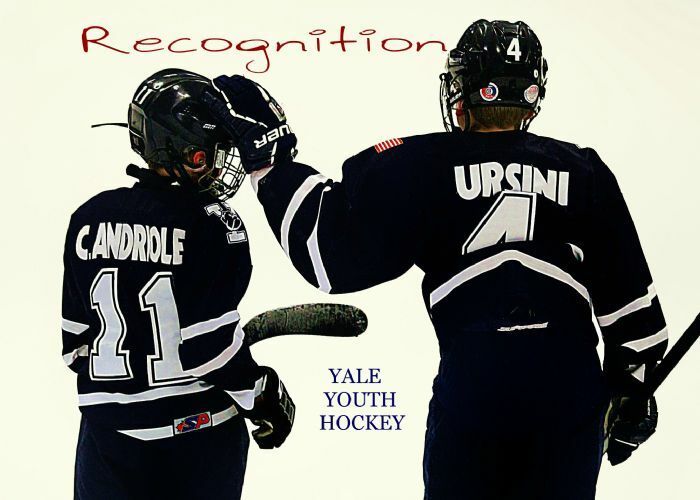 The Yale Youth Hockey Association Congratulates Daniel Farricielli, Ethan Labagnara, Jack Marottolo, Michael McKeon, Tyler Miller and Matthew Ursini the 2015-2016 recipients of the prestigious Carl Marottolo Award. The Marottolo Award recipients best exemplify the spirit of Carl Marottolo through their enthusiasm, love of the sport of hockey and of course their dedication to the Yale Youth Hockey Association. Please join Dan, Ethan, Jack, Mike, Ty and Matt on Friday, February 19th at Ingalls Rink during the Yale Vs Saint Lawrence Men's game to celebrate this wonderful accomplishment. The presentation will be made at center ice during the 1st intermission of the game. 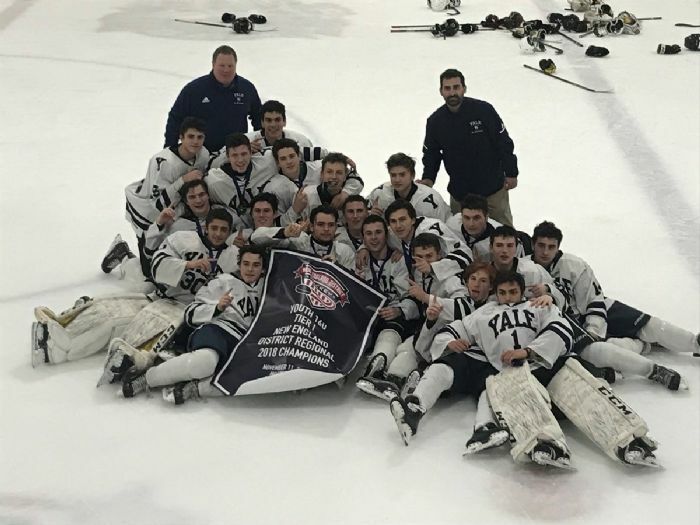 Congratulations to our Yale Midget U-16 who won the New England Region Championship this past weekend and will compete in the Nationals, March 31-April 4 in San Jose. 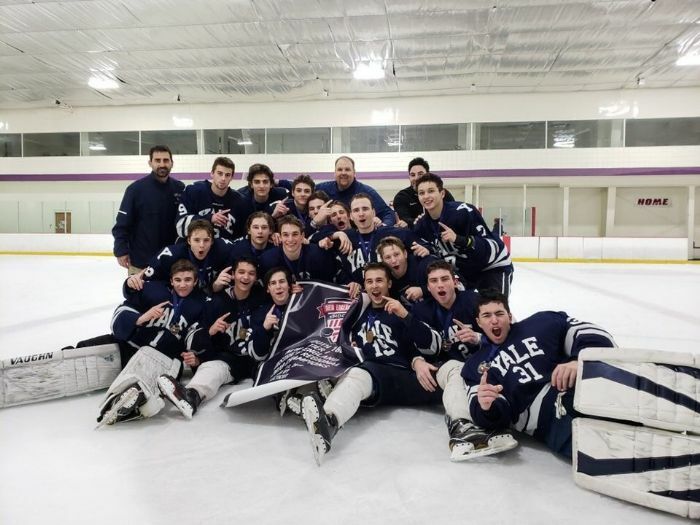 Congratulations to our Yale Midget U-18 who advanced to the Championship Game, losing to Mid-Fairfield. This is a wonderful accomplishment for all. Try Hockey For Free event! As many already know Yale Youth Hockey is hosting a Try Hockey for Free event on November 7th. I am sending out this note to ask everyone for three things! Please help to spread the word about this event to friends and families who might be interested in getting involved in the great game of hockey. If anyone knows who to talk with in their local school system I would greatly appreciate the intro so that we can get an email / flyer sent out to parents of children aged 10 and under. We need skates badly! These can be donations that we use every year or these can be skates on loan for the event and I can get them back to you. Please check to see if you have any skates that may be too small for your child at this time and that you can donate. We will gladly take them off your hands. We need volunteer’s for this event to be a success. If you are willing to help on Saturday the 7th. We would love to have you. 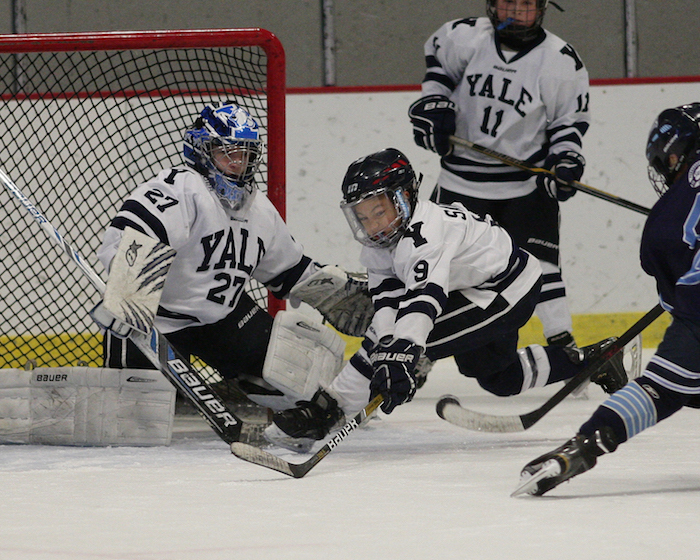 The Yale Youth Hockey Association is pleased to host the First Annual Yale Midget Invitational Jamboree this weekend. This is an opportunity to see the best U-16 and U-18 players and teams in the country play and compete. Our Jamboree will begin Saturday at 2:00PM and Sunday at 8:00AM. The Jamboree with feature an iconic group of elite teams including Yale U-16 National, Yale U-18 National, Yale U-18 American, Mid-Fairfield, Selects American (South Kent School), Selects Academy (South Kent School), Connecticut Junior Rangers, Neoponset Valley River Rats (Massachusetts), Springfield Rifles (Massachusetts), Northern Cyclones (New Hampshire), New Jersey Avalanche and New Hampshire Avalanche. Yale Youth Hockey is honored to host such an elite group of players and teams. Thank you to Coach Steve Novodor and Coach Jon Bellonio for organizing our Jamboree and Good Luck to all players and teams. Yale Youth Hockey Players and Parents, this is an opportunity to see the best of the best U-16s and U-18s play hockey. Many of our players aspire to play elite hockey. This is an opportunity to see elite hockey, hosted by us, at Ingalls Rink and Wesleyan. Please make an effort to join us this weekend. 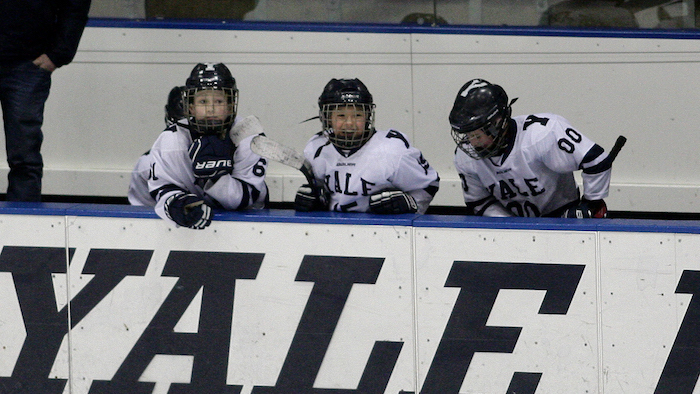 Yale Youth Hockey has been designated a USA Hockey Model Association, one of twenty in the country. This is a great honor and a testament to our dedication to the development philosophy of our children/players as athletes and individuals. Congratulations to our Yale Midget U-16 National team, Champions Boston Junior Bruins Shootout. Our team traveled to Massachusetts this past weekend to compete against many of the top U-16 teams in our country, returning home Champions. 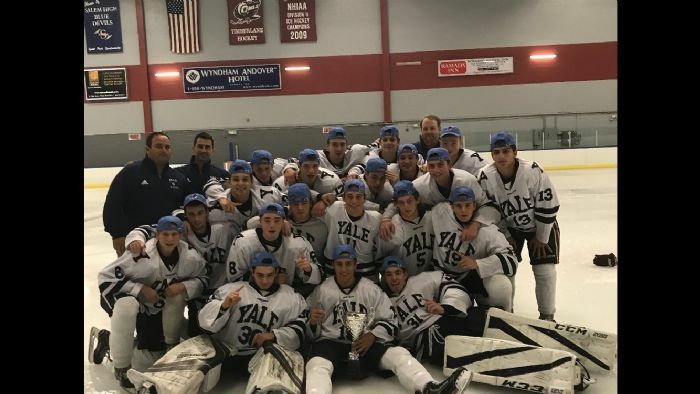 This is a wonderful accomplishment for our Coaches Steve Novodor and Jon Bellonio, players and the Yale Youth Hockey Association. The Try Hockey for Free Event is a joint-effort between USA Hockey, the National Hockey League and NHL member clubs, and is designed to provide local associations a national platform to introduce new kids to youth hockey. 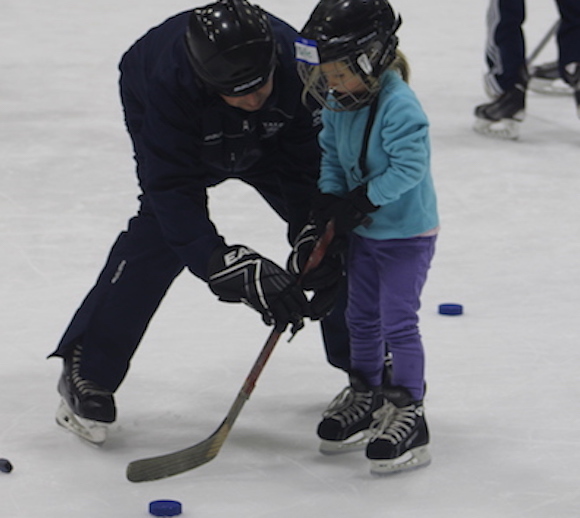 During the national Try Hockey For Free Days last season, close to 25,000 kids between the ages of 4-9, tried youth hockey for the first time. We need volunteers and equipment these children can borrow for the event. Please help us introduce hockey to local children. We need old/outgrown skates, helmets, elbow pads, shin pads, shoulder pads, sticks, etc. Jess Kane will handle the collection, however we need to start now. Start looking around your home for this equipment and get it to the rink and Jess Kane. Yale Youth Hockey Association Board Member and Director - Grow the Game - Jess Kane - Kane.JK@gmail.com is the Chairman of this event. Please contact Jess. Yale Youth Hockey Association Board Member and Director - Grow the Game Jess Kane Kane.JK@gmail.com is the Chairman of this event. Please contact Jess. Jared Waimon's Pro Crease will again conduct our Goalie Specific Skills Training for 22 Weeks on Monday's at H3. Mite/Squirt 7:20PM-8:20PM and Pee Wee/Bantam 8:30PM-9:30PM. Alex Westlund will be working with Pro Crease this season and he will be running 75% of our sessions. Alex is a former All American at Yale University from 1995-1999 and then went on to a 15 year Professional career. He recently retired and will be the Goalie Coach one week per month for the Augsburg Panthers in the premiere league in Germany. The other weeks he will be here at Yale Youth Hockey. The Pro Crease staff will conduct our sessions the one week a month he is not available. 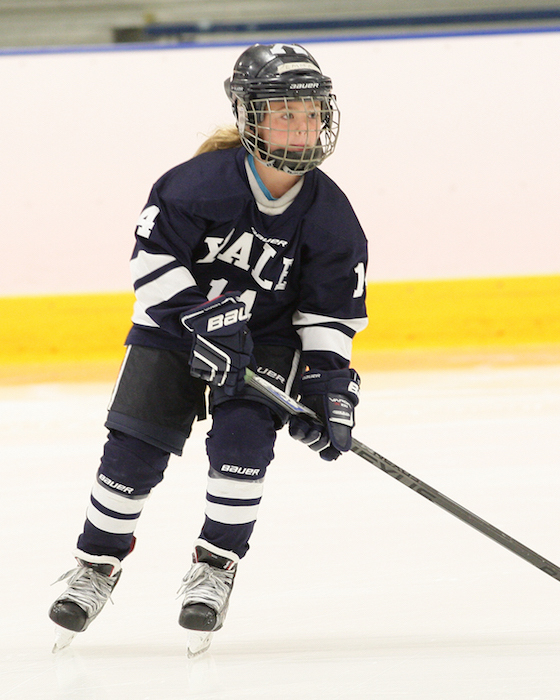 This is great news for Yale Youth Hockey. Shaun Hannah will again conduct our Skaters Powerskating and Skills Training for 22 Weeks on Monday's at Ingalls Rink. Mite/Squirt 7:20PM-8:20PM and Pee Wee/Bantam 8:30PM-9:30PM. Yale Youth Hockey Association is pleased to announce that Coach Steve Novodor and Coach Jon Bellonio will join Yale Youth Hockey as Coaches of our 2015-2016 Midget teams. Steve and Jon fit uniquely into our future youth hockey development and coaching development model. They will begin immediately following the current 2014-2015 season in April. This is a great opportunity for Coach Novodor and Coach Bellonio to integrate, contribute and flourish in our collaborative coaching environment. Steve and Jon will be strategically and actively involved in our Mite, Squirt, Pee Wee, Bantam and Midget levels. 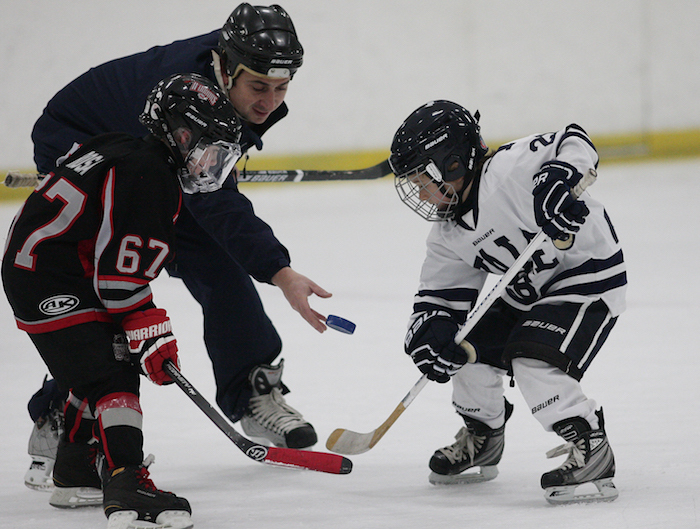 Yale Youth Hockey Association welcomes Coach Novodor and Coach Bellonio. Steve Novodor begins his first season at Yale Youth Hockey in 2015-2016, serving as Head Coach of both the U-16 Tier 1 Split Season team and the 2002 Bantam AA team. Prior to joining the Bulldogs, Coach Novodor spent numerous seasons in the Junior Bobcats/Wolf Pack organization, coaching at the Pee-Wee, Bantam, and Midget levels. In 2013, Coach Novodor led his team to the USA Hockey U16 National Championship game, falling just short against the Chicago Mission. In addition to his work at the youth hockey level, Coach Novodor also spent three seasons as an Assistant Coach at Loomis Chafee Prep School, helping build the Pelicans into the powerhouse that they currently are. He also currently serves as a scout for the Muskegon Lumberjacks of the USHL, the only Tier 1 Junior Hockey League in the United States. Jon Bellonio begins his first season at Yale Youth Hockey in 2015-2016, serving as Head Coach of both the U-18 Tier 1 Split Season team and the 2003 Pee-Wee AA team. Coach Bellonio comes to the Bulldogs with extensive experience throughout prep, junior, and college hockey. From 2011-2014, Bellonio spent three years as an assistant coach at Wesleyan College. Prior to joining the Cardinals, Coach Bellonio spent time in the United States Hockey League as a coach for the Lincoln Stars. He also coached in the EJHL with the Philadelphia Revolution and began his career as an Assistant Coach at South Kent Prep School. In addition to coaching at Yale Youth Hockey next year, Bellonio will also continue to serve as a scout for the Bloomington Thunder of the USHL, the only Tier 1 Junior Hockey League in the United States. Roger Grillo USA Hockey ADM Regional Manager - New England and Massachusetts Districts is coming to New Haven to speak to Yale Youth Hockey Parents, Coaches, and Member Families on Tuesday, October 14th at 6:00PM, at the Yale Law School. 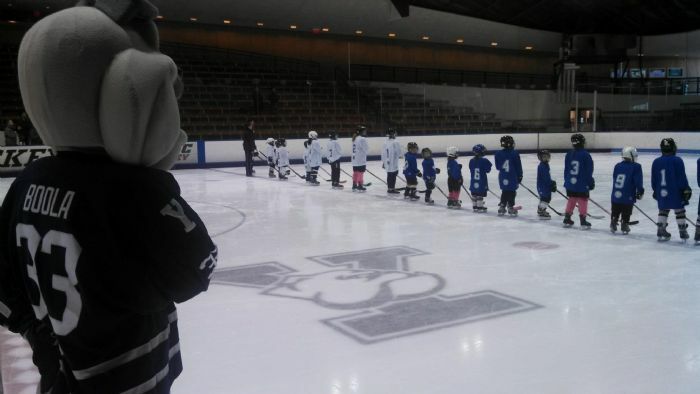 There will be no Yale Youth Hockey Practices on October 14th. This is a very important and valuable meeting. We are requesting All Member Families make every effort to attend.